Football is a game of two sides. How you play is a choice you make every time you take to the pitch. Do you have fire in your heart, or ice in your veins? Meet the ‘Fire & Ice’ Pack. The world of football has been thirsting for a full range Nike launch for months and now Nike are ready with their biggest release since the ‘Rising Fast’ Pack, which just so happens to be the largest football boot release of all time. 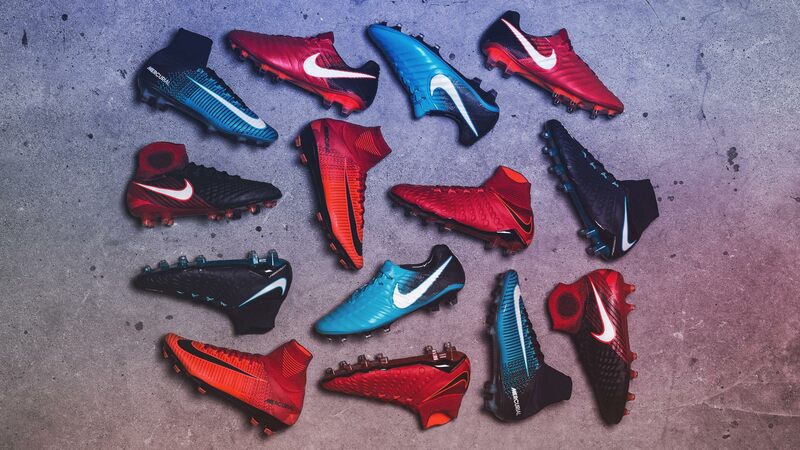 In terms of size the ‘Fire & Ice’ Pack is absolutely gigantic, because for the first time ever Nike will be releasing two colourways for each boot, which means there are a total of 14 different boots that will be worn by pro athletes. Add to that the different stud-configurations, Anti-Clog and different price ranges and we have counted the total amount of boots to a mind-boggling 178 different types in the pack alone. Now that’s what we call spoilt for choice! Buy your new Nike Fire & Ice Pack football boots. The reason for there being two different colours for each boot lies in the design inspiration, which comes from the two styles of play you see in football. It’s all about the way you play. It doesn’t matter what position you play, because the way you play on the pitch is what truly defines you. Are you Team Fire and thrive when you’re taking risks or are you the Team Ice players, who always plays it cool and clinical? Nike have looked at every club and the style that defines them best and will divide them all evenly between Team Fire and Team Ice. That means you can look forward to seeing clubs like Manchester United and Arsenal playing for Team Fire, while Team Ice is repped by Manchester City and Tottenham. Some juicy local rivalries that just got even more split! The boots will not be worn in the Champions League tomorrow and Wednesday, but this coming weekend you can start looking out for the boots, because that’s when they will be getting their on-pitch debut.